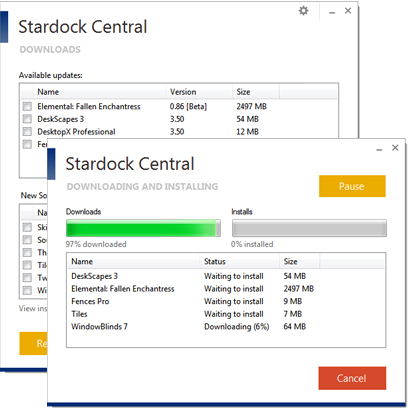 Stardock Central is currently in BETA and available for free. You can also download full installs and updates from your My Downloads page on the Stardock store. Securely install and manage Stardock's software products today! Install new software tied to your Stardock account and any available updates. Edit your settings to automatically check for updates and how frequently to do so. Set notifications so that you know when downloads are ready to be installed. Silently install software and show beta downloads. Select the file location where you would like to save all of your downloaded files for backups or reinstalling.